OSSC Notification is out. OSSC is recruiting for 878 Ayurvedic Assistants And Homeopathic Assistants Govt Job Posts. You can check OSSC - Odisha Staff Selection Commission last date, download OSSC notification, visit OSSC official website and check other OSSC Vacancy details.Complete Vacancy and recruitment Details about 878 Ayurvedic Assistants And Homeopathic Assistants Govt Job vacancies in OSSC are provided below by JobSarkari.Com only for you. Last Date of Apply Online. 19/04/2019. Last Date of Pay Fee. 19/04/2019. Mode of Payment. Candidate Need to Pay Fee Through Online Mode. Ayurvedic Assistants. 208. 00. 92. 135. 435. Homeopathic Assistants. 210. 42. 75. 116. 443. Total Vacancy. 418. 42. 167. 251. 878. Candidate Must Have Passed Class 12th in Science And Must Able to Read, Write And Speak Odia As Mentioned in Notification. Age Relaxation. 5 Years For SEBC, SC/ ST And 10 Years For PH. 2. Candidate Can Choose Their Post And Click on the Registration Link As Given on our Website in Important links Section. 7. Please Remember and Save your Registration No. And Password for Further References. 8. Online Application can be Submitted on or Before 19th April 2019. Q. What is the Last Date For OSSC Ayurvedic Assistants And Homeopathic Assistants Govt Job Vacancy ? A. 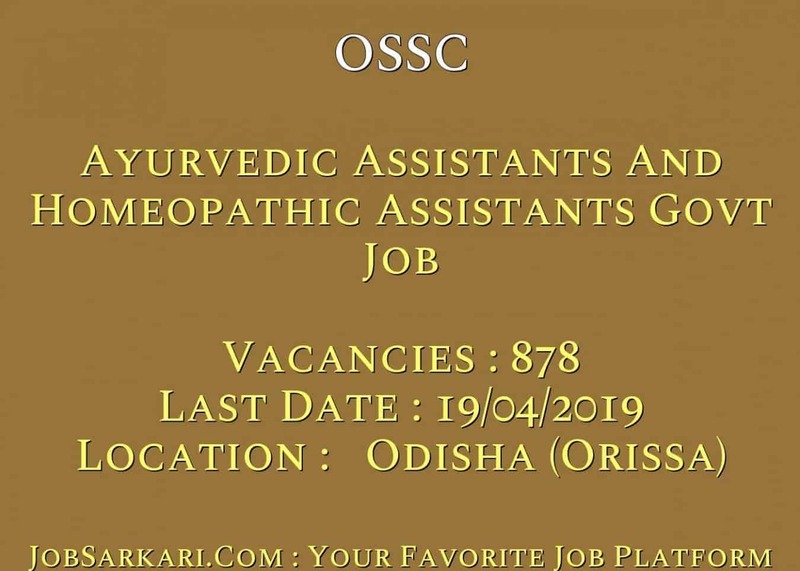 Last Date for OSSC Ayurvedic Assistants And Homeopathic Assistants Govt Job Posts is 19/04/2019. Q. What is the Form Type of OSSC Ayurvedic Assistants And Homeopathic Assistants Govt Job Recruitment ? A. The Form Type for OSSC Ayurvedic Assistants And Homeopathic Assistants Govt Job Posts is Online. Q. 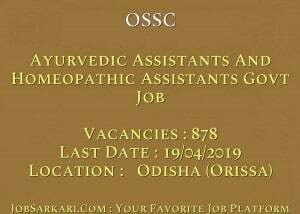 How many vacancies are available in Odisha Staff Selection Commission Ayurvedic Assistants And Homeopathic Assistants Govt Job Posts ? A. There are about 900 Vacancies in Odisha Staff Selection Commission Ayurvedic Assistants And Homeopathic Assistants Govt Job Posts. Q. What is the Full Form of OSSC ? A. Full Form of OSSC is Odisha Staff Selection Commission .